Posted on September 28, 2012 by Susan H.
Add some fresh Dairy, Egg and Peanut/Tree Nut Free French Stick for dunking…perfect! I have been making my version of Pasta Figioli for years now…not quite sure of the original recipe’s origin. I remember watching a program on television and then quickly writing down what I could remember of it…over the years, I have fiddled with the measurements to create a ‘classic’ recipe for our family. All the veggies in the Pasta Figioli has been a bit off-putting for the boys. However, the smell of the soup simmering on the stove top has always been very alluring! Just a few years ago, Michael decided he had had enough of smelling the soup…he was ready for a bowl of his very own! As I was not completely sure of his safety with legumes…specifically the white and red kidney beans in the Pasta Figioli…I simmered a separate pot of Pasta Figioli without the beans in it for him to try. He loved it! 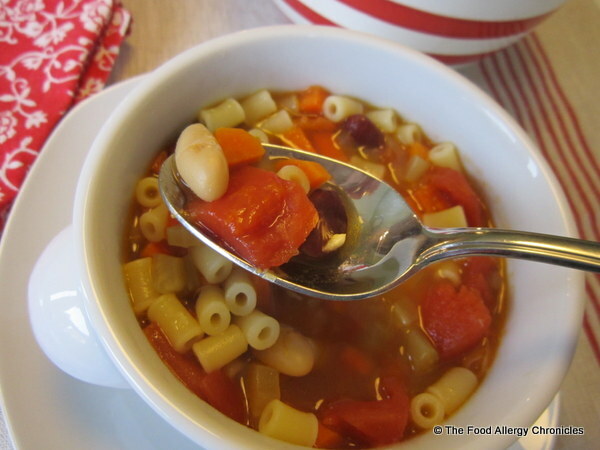 As he tested negative at the allergists for kidney beans, followed by a taste with no reaction…I decided it was the perfect time for Michael sample kidney beans in the Pasta Figioli. What better way to try them? I think kidney beans are the best part of Pasta Figioli!Unfortunately, Michael did not agree…”They’re gritty!”, he grumbled, as he proceeded to pick out the few beans that were in his Pasta Figioli. “I like it better without the beans.” Texture can still be an issue with Michael…his limited diet growing up was very bland with little exposure to different textures. The teenage years are a whole new ballgame! I think I should write a post on that topic…although, being a teenager, Michael may not approve of such an idea! In a small pot, cover the head of garlic with water and bring to the boil. Simmer for 10 minutes. Drain water and let cool. Peel off outer skin on each garlic clove and set aside. In a large pot, heat oil on medium heat. Saute garlic and red pepper flakes, tossing until garlic is starting to brown. Add onions, saute until softened. Add carrots and celery, saute until softened. Pour in tomatoes with juices, chicken/vegetable broth and both kinds of kidney beans. Bring to a boil. Lower heat to simmer at least an hour, stirring occasionally. Ladle soup in soup bowls and top with our favourite short pasta, rice or quinoa. I love mixing my Pasta Figioli with quinoa, (see picture under heading) while all the boys in my family prefer Tubetti pasta by De Cecco (seen in picture above). Tip 1: The longer the Pasta Figioli simmers, the longer the flavours have to mingle. I will sometimes make my Pasta Figioli in the morning and let it simmer throughout the day. Tip 2: Pasta Figioli is one of those dishes that tastes better the next day reheated to take to work for lunch, dinner a second night or frozen for a quick go-to meal on those days when you need some comfort food! Tip: 3: As the pasta tends to soak up all the liquid if left in the soup, I tend to let everyone dish their own amount of pasta/quinoa/rice with their soup. Question: Do you have a favourite soup for the cooler days of Fall? 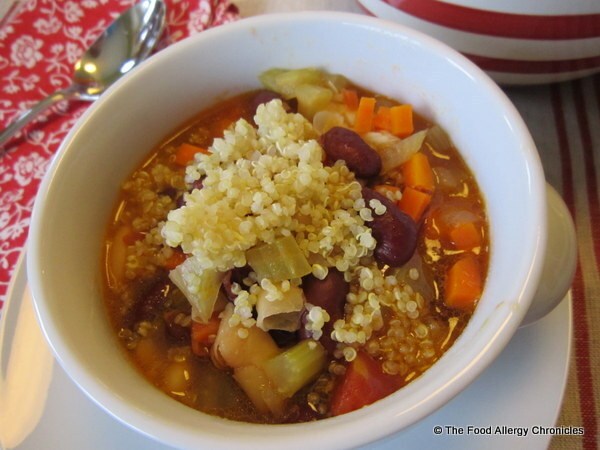 This entry was posted in breads, dinner, lunch, multiple food allergies, side dish, soups, vegetables and tagged Pasta Figoili, soup by Susan H.. Bookmark the permalink. I love all the veggies! I may try to simmer all day, sounds wonderful. I understand with the quinoa…I add it to many items myself! Depending on the size of the veggies, I may add more…the recipe is very flexible! Enjoy! Mmm…. Looks wonderful! (minus the beans… Not a bean lover! lol!) My favourite soup would be something spicy & hearty, definitely tomato based! Yum! 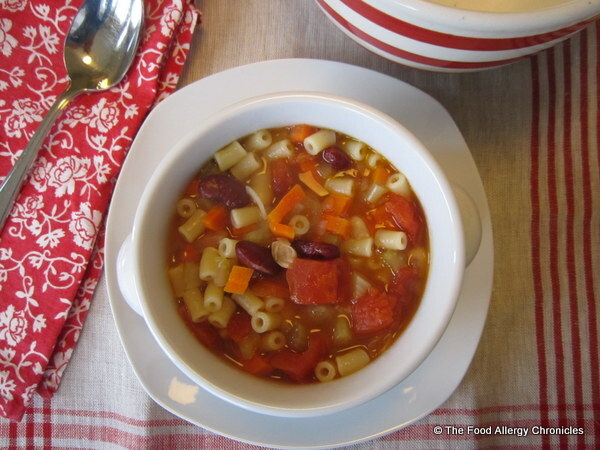 I love this soup as it can be as hearty and spicy as you like! Enjoy!